My father was born in 1945 and spent his childhood in Newark, (pronounced ‘nork,’ regardless of what you’ve been told) New Jersey. His family lived in the Ironbound – a.k.a. “Down Neck”. Wikipedia describes it as a large, working class neighborhood; but my understanding is that there wasn’t a lot of work and even less money when he was growing up. Black & white photos of my father as a child look like stills from a Bowery Boys film: a bunch of scruffy kids in hand-me-downs hanging out in a back alley. And like the films, his stories are about getting into trouble. Like the time his brothers blew up the basement using a chemistry set that the salesman assured my grandmother was completely harmless; or when his one friend chased the truant officer with a bow & arrow that he’d learned to shoot at the Boy’s Club; or how my dad stole his sister’s car and stalled his way down Ferry Street, his best friend sitting in the passenger seat laughing the entire time (he was 12). Mayberry it definitely was not. But I loved hearing those stories. I still do. So it’s not surprising that the landscape of Philip Roth’s new novel is completely familiar. Or that I was invested in it even before I started reading. Nemesis, Philip Roth’s 31st book (and my 1st Philip Roth novel) is set during the Summer of 1944. A polio epidemic is terrorizing Newark. The principal character is Bucky Cantor, a young playground director kept out of military service by bad eyes and a 4-F classification. Raised by his grandparents, Cantor is everything a hero should be – honorable, athletic, “a great fellow” with a clearcut sense of right and wrong. The book opens with him standing down ten Italian punks from Ironbound (the first neighborhood hit by the disease) who’ve come to “spread some polio” in Jewish Weequahic. Bucky, taught by his grandfather that a man is defined by his responsibilities, becomes a neighborhood hero for protecting the playground and the children under his care. He’s universally admired and respected. But as the novel progresses Bucky is forced to watch, helpless, as boys under his charge succumb to the virus. And we are led to question whether the very qualities we admire in Bucky will ultimately be his undoing. Because the disease ravaging the playground boys is illogical, unpredictable, indefensible. Polio becomes Bucky Cantor’s personal nemesis; an enemy he can’t fight and is ill-equipped to understand. Roth has crafted a complicated character study, compressed into a relatively small book (only 280 pages – large type on 7-1/2″ x 5″ sheets). It is a monument to restraint. The narrative ambles along in prose that is remarkable in its conventionality – he makes it look easy. Until, seemingly out of nowhere, comes a passage like the one below. To be sure, he himself hadn’t dared turn against God for taking his grandfather when the old man reached a timely age to die. But for taking Alan iwth polio at twelve? For the very existence of polio? How could there be forgiveness – let alone hallelujahs – in the face of such lunatic cruelty? It would have seemed far less an affront to Mr. Cantor for the group gathered in mourning to declare themselves the celebrants of solar majesty, the children of an ever-constant solar deity, and in the fervent way of our hemisphere’s ancient heathen civilizations, to abandon themselves in a ritual sun dance around the dead boy’s grave – better that, better to sanctify and placate the unrefracted rays of Great Father Sun than to submit to a supreme being for whatever atrocious crime it pleases Him to perpetrate. Yes, better by far to praise the irreplaceable generator that has sustained our existence from its beginning – better by far to honor in prayer one’s tangible daily encounter with the ubiquitous eye of gold isolated in the blue body of the sky and its immanent power to incinerate the earth – than to swallow the official lie that God is good and truckle before a cold-blooded murderer of children. Better for one’s dignity, for one’s humanity, for one’s worth altogether, not to mention for one’s everyday idea of whatever the hell is going on here. In addition to incredible writing, Nemesis has an interesting and unusual structure. Nothing formulaic or gimmicky – Roth is too skilled and mature an author to fall into either of those traps. It’s just… unexpected. Most of the novel is narrated in the omniscient, third person. All pretty standard up till the sentence: “Three more boys had come down with polio – Leo Feinswog, Paul Lippman, and me, Arnie Mesnikoff.” That one sentence on page 108 is the only place in the first two sections of Nemesis where Arnie makes his presence known. Yet, with that simple “and me” the narrative has changed. A layer of nostalgia is inserted between the reader and the plot. The voice telling the story has moved outside of the main action, gains both a personality and a backstory of its own. (It reminded me of the voice-over commentary in the film Stand By Me). The distance between the reader and Bucky is extended even further in the third and final part of the novel, when Arnie finally steps onto the main stage to explain everything we have read from his perspective – now written in the first person. That third section reads like a soliloquy. This revelation of the man behind the curtain should be jarring – fracturing the relationship we have established to Bucky. And yet it has the opposite effect, pulling us further into the story and deepening our engagement and psychological understanding of our hero. It would have been easy to simply say polio destroyed Bucky Cantor’s life and to leave it at that. Arnie (and through him Roth) forces us to admit that while it would be easy to say that, it wouldn’t be true. 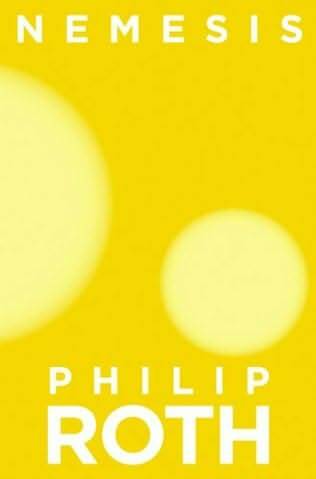 Nemesis is, in the end, a fascinating examination of Philip Roth’s everyman. Needless to say, having finally “discovered” him, I’m looking forward to reading more by Roth. I know very little about him other than that he has a huge following, and a list of awards that is both impressive and intimidating. For all I know Nemesis is an atypical example of his writing. So, Roth fans, speak up. Which is your favorite novel? What would you recommend reading next? Or better yet – if you could take only one Philip Roth novel with you to a desert island, which one would it be?